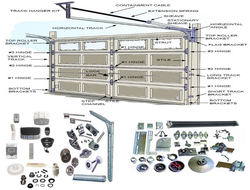 Sectional Overhead Doors Spares & Accessories Description: Garage door accessories, which complement your opener, are engineered with your convenience in mind. Each accessory features something different to help you enjoy your new Overhead Door opener or garage door system to the fullest. Add-on garage door accessories are compatible with products that feature the Remote Rolling Code Access Security System.